The 1st of May, besides being International Workers Day, is also the day in 1859 that the Englishman John Walker, inventor of friction matches, died. Walker’s matches, developed in 1826, were small wooden sticks with the tip coated in sulphur with a mixture of potassium chlorate, antimony sulphide and sugar, bound together with gum arabic. He arrived at this mixture after several previous failed attempts. Walker, recognising the potential of his invention, started selling his matches, packaged in boxes of 50 together with a folded piece of sandpaper as a striking surface. Even though he never patented his invention, he managed to earn a good income through the sale of his matches. 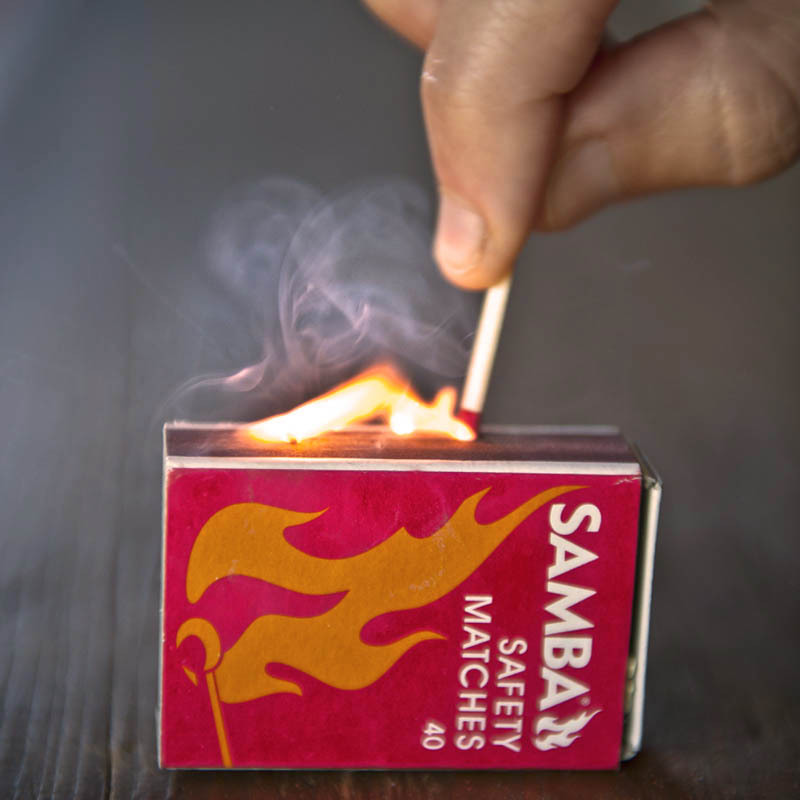 Lighting a modern day safety match – much safer than lighting John Walker’s 1826 friction matches! John Walker wasn’t the first guy to come up with the idea of friction matches – some 10 years earlier in 1816, Frenchman Francois Derosne attempted something similar, using sulphur-tipped sticks that had to be scraped inside a phosphorous-lined tube. Derosne was, however, unable to make his matches stable enough to be practically viable. While Walker’s matches worked better than those of Derosne, they were still quite unstable and flammable, and sometimes flaming balls of the ignition mixture dripped from the lit match, burning holes in clothing, carpets etc. This led to them being banned in France and Germany. Over the next few years, many improvements were introduced to Walker’s friction matches. Most early versions were still volatile, lighting with a strong chemical reaction, burning with unsteady flames, and casting sparks over quite a distance. These early matches came to be known as ‘lucifers’ – a term that persisted into the 20th century and is still used in some countries. It took almost 20 years before the modern-day safety match was developed in 1844. The main innovation in the safety match lay in the striking surface rather than the match. By including red phosphorous in the striking surface, the ignition mixture on the match could be made less volatile. The safety match was perfected and commercialised by Swedish brothers Johan Edvard and Carl Frans Lundstrom, who sold around 12 million boxes of matches between 1851 and 1858. Sweden remained the home of safety matches until the start of the 20th century, with the safety matches as we know it today, still being very similar to those developed in the 1850’s. So next time you light a match, think about the fact that you’re using an invention that is almost 170 years old!